Agricultural Economic Insights Approaching the ARC-CO Payment Cliff? At the end of October the USDA provided a Halloween treat by making ARC-CO payments for several 2014 crops. In fact, USDA reported that 800,000 farms received ARC-CO payments. The 2014 ARC-CO payments totaled $3.9 billion with the vast majority ($3.3 billion) paid on corn base. This wasn’t surprising as the ARC-CO program was very popular with corn and soybean farmers, with over 90% of farms and base acres enrolled in the program. As we discussed in an earlier post, government support has played a key role in moderating the impact of farm income downturns. However, the payments provided under this farm bill will almost certainly be less than that in previous periods of low income. Further, given the structure of the ARC-CO program it is quite likely that program payments for corn will begin to fall after the 2015 payments. ARC-CO payments are dependent upon county crop yields, market year average (MYA) prices, and their 5 year Olympic averages. Since we now have the previous five years of price and yield data we can calculate the Olympic average prices and yields for the 2015 program. The Olympic average is calculated by removing the high and low values from the calculation of the average. This means that the averages are based on 3 values. Table 1 shows the MYA prices used in the calculations for corn, soybeans, and wheat from 2009 to 2014. The MYA prices have been adjusted to replace prices below the reference price with the PLC reference price. This was the case in 2009 for corn and wheat. Table 1. Adjusted Market Year Average Prices for Corn, Soybeans, and Wheat, 2009 to 2014. The calculation of the Olympic average price for each commodity is shown in Table 2. For corn and soybeans the exact same values were used to calculate the averages in 2014 and 2015. In both cases, replacing the 2009 MYA price with the 2014 MYA price did not change the calculation. This happens because the 2014 values will simply replace the 2009 values as the low values removed from the calculation. In the case of wheat, the 2015 average price increases as the 2014 value of $5.99 replaces the 2010 value of $5.70 in the calculation. Table 2. 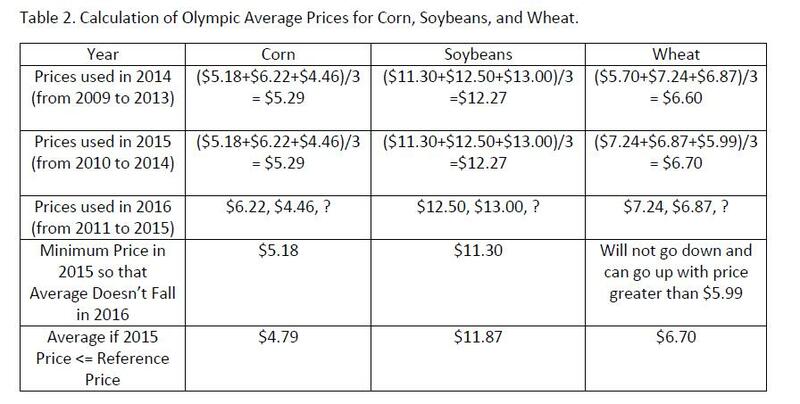 Calculation of Olympic Average Prices for Corn, Soybeans, and Wheat. It is not possible to calculate the exact values of the 2016 Olympic averages until we know the prices for 2015, but it is possible to say quite a bit about the direction those values are likely headed. The second to last row of table 2 shows the minimum 2015 price required to keep the 2016 Olympic average from falling. Corn and soybeans the 2016 average will fall unless the 2015 MYA prices are $5.18 and $11.30 respectively. Market year average prices at this level seem quite unlikely at this point. For instance the high values of the current WASDE forecast are $3.95 for corn and $9.65 for soybeans. In other words the price guarantee for corn and soybeans will probably begin to fall with the 2016 crop year (payments that will be received in 2017). Wheat is in a little bit better position. The 2016 average will not fall and could increase if the 2015 MYA price comes in above the previous low value used in the calculation of $5.99. The current high end of the WASDE forecast is $5.20, so increasing prices may not occur but at least the guarantee won’t fall in 2016. The last row of the table shows what the 2016 price guarantee would be if prices were to fall at or below the reference price for each commodity. Government program payments will provide some support to farm incomes during the ongoing farm economic downturn. Given current price levels and the price guarantees associated with the ARC-CO program, many farms will likely receive payments for the 2015 crop. However, these payments will depend upon the actual yields achieved in a particular county, something that won’t be estimated for some time. While it appears that payments for 2015 will likely meet or exceed those in 2014, the Olympic average calculations for the ARC-CO program will result in lower price guarantees for corn and soybeans in 2016. In order to avoid price guarantee declines, prices would have to increase substantially from their current levels. This would also reduce the likelihood of 2015 program payments. In other words, it is almost certain that the total payments made under the program will begin to decline for corn and soybean producers starting in 2016. If the current price outlook does not change it will be imperative for farmers to wisely manage their financial situation. As we pointed out earlier, it is unlikely that government program payments will provide the level of support that they have in previous economic downturns.